Matt Jennings saw Ocmulgee National Monument for the first time in 2000 when, as a graduate student in History at the University of Illinois, he attended an archeological conference at the prehistoric Native American site in east Macon. Seven years later, as a newly minted Ph.D, Jennings began his search for a teaching job in higher education. One of his interviews was at what is now Middle Georgia State University (MGA). Now, as an MGA associate professor of History, Jennings is a prominent figure in the community of scholars studying Ocmulgee National Monument as its story continues to unfold. His ongoing research includes exploring the relationship between Native American peoples and the mounds at Ocmulgee, as well as the intertwined history of tourism and archaeology at the site. He is among the voices encouraging Congress to elevate ONM to national historic park status, a promotion from “monument” that could raise the site’s visibility and pay off in tangible economic benefits for the city and surrounding region. People have called the land near the Ocmulgee River in present-day central Georgia home for a long time, perhaps as many as 17,000 years, and each successive group has left its mark on the landscape. Mississippian-era people erected the towering Great Temple Mound and other large earthworks around 1,000 years ago. In the late 17th century, Ocmulgee flourished as a center of trade between the Creek Indians and their English neighbors. In the 19th century, railroads did irreparable damage to the site in the name of progress and profit, slicing through it twice. Preservation efforts bore fruit in the 1930s, when Ocmulgee National Monument was created. Since then, people from all over the world have visited Ocmulgee. They come for many reasons, but they invariably leave with a reverence for the place and the people who built it hundreds of years ago and those who have maintained it in recent decades. Asked what he considers the most fascinating aspect of Ocmulgee, Jennings says it’s impossible for him to pick just one. Jennings’s pictorial history of Ocmulgee published by Arcadia is aimed at a general audience. His academic work related to the site includes research presented in many different venues, including the American Historical Association, the Georgia Association of Historians, the Southeastern Archaeological Conference, the Southeast Indian Studies Conference and the Native American and Indigenous Studies Association. Including the pictorial history, Jennings has published three books on different aspects of Native American history as sole author and contributed chapters to two others. With his MGA colleague Dr. Stephen Taylor he published another Arcadia text on the history of the Macon. One of his current writing projects, scheduled to be published by Mercer University Press in 2018, is an academic history of Ocmulgee, focusing on the moments at which significant numbers of Muscogee (Creek) Native Americans visited Macon. The book, Ocmulgee: A New Concise History and Writer’s Notebook, will include Jennings’s history of the site along with related poetry and stories compiled by Gordon Johnston, director of Creative Writing at Mercer. As Jennings completes his first decade at MGA, Ocmulgee National Monument remains a rich source of research and wonder for him. He avoids using the “Mysteries of the Mounds” phrase that often shows up in publications and information videos about the site but acknowledges there is plenty we don’t know about Ocmulgee. 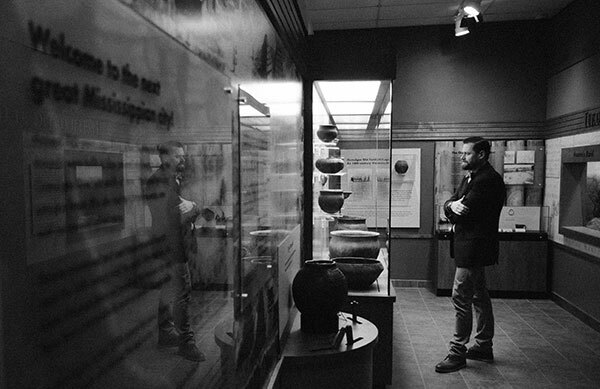 Photo: Dr. Matt Jennings, associate professor of History at MGA, inside the Visitors Center at Ocmulgee National Monument. The photo was taken by John Legg, a History major at MGA who works as a professional photographer. This article originally appeared in the spring 2017 issue of MGA Today.